I'm fighting with a lacking mojo at the moment so I'm hoping that keeping up with my posts here at WM each week will kick-start it sooner or later! 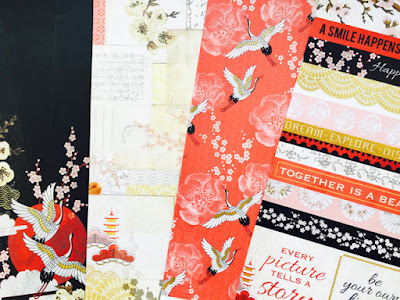 Recently, I spied some papers at Scrapabilly by Kaisercraft that I just knew my sister would adore. She stopped scrapping some time ago and I've been trying to lure her back ever since. She loves all things oriental and I thought it might nudge her into cutting some paper. She really did love the products I sent but so far, no layout! Ha ha. But I got myself one or two the items for myself and this week, I'd like to find the inspiration to use it. Hence this week's prompt. I'd like you to be inspired by these oriental design papers. I think they are just beautiful and could use them for many different styles and types of pages. You might have some similar designs in your own stash or you might be inspired by the bright colour combinations. Maybe you just take one or two of the elements in the papers here to inspire you - design, colour, words. The cranes might spark a bird themed story of your own or maybe you've been lucky enough to travel to the orient and want to make a travel-themed page. Origami, cherry blossoms, pagodas or buddhist temples. Maybe you just want to concentrate on your love of yoga, meditation or general worship. There's many directions if you think about it! Which way will you go this week? Many many years ago, I bought some gorgeous paper for a Singapore themed page but of course I can't find a photo of it right now. If I track it down, I'll post it or maybe I'll just remake it as I think it's one that I earmarked to redo! However, I remember that there was lots of cherry blossom fussy cutting which was really pretty.